Please help people inside Syria. Click the button below to donate to our Syria in Crisis Appeal now. Donations will support the work of our ACT Alliance partner, International Orthodox Christian Charities (IOCC). 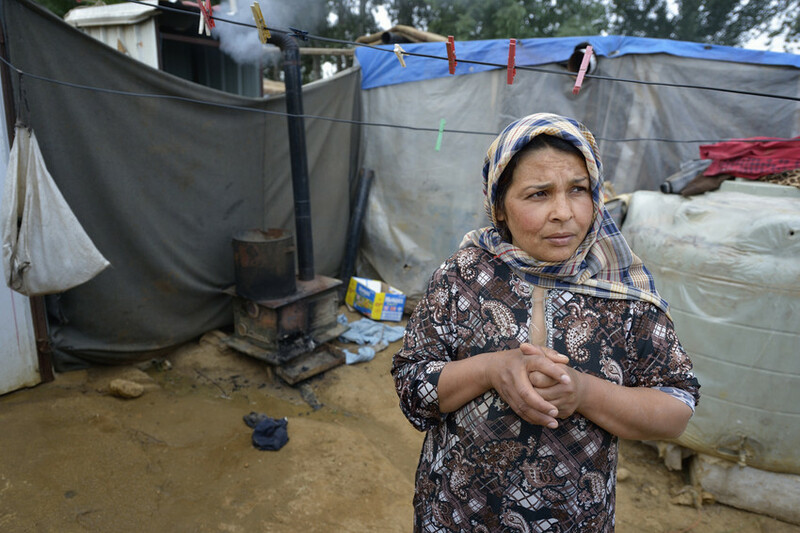 Fadia, who escaped fighting in Aleppo, Syria, stands in front of her family’s shelter in the Aamer al Sanad refugee settlement in Kab Elias, a town in Lebanon’s Bekaa Valley which has filled with Syrian refugees. Two of her ten children were killed in Syria’s civil war. Lebanon hosts some 1.5 million refugees from Syria, yet allows no large camps to be established. So refugees have moved into poor neighborhoods or established small informal settlements in border areas. International Orthodox Christian Charities, a member of the ACT Alliance, provides support for refugees in Kab Elias, including a community clinic. The IOCC is one of the few organisations working inside Syria to bring urgent aid to vulnerable people in some of the most volatile areas. Since 2012, the IOCC has helped more than 2.5 million vulnerable people inside Syria. Due to the ongoing civil war, most agencies are unable to reach these people, and instead are assisting refugees outside Syria. The IOCC is one of the very few relief agencies working inside Syria to help some of the millions of people suffering within their own war-torn country. This work is dangerous and difficult, yet they continue each day to provide relief. The IOCC’s work includes the provision of emergency food and water, hygiene kits, education on disease prevention, hygiene and safe use of water, distribution of water filters, provision of bedding and other physical needs, helping people to cope with the emotional stress of the situation (psychosocial support), helping children to continue their education, and providing cash-for-work opportunities. Families in Syria need this ongoing support as the crisis continues. The situation in Syria is constantly changing, as are the numbers of people affected. About 560,000 people have been killed in the Syrian war since it began eight years ago. More than 1 million Syrian children have been born in exile since the war began. About 37,000 refugees returned to Syria this year, despite massive hurdles facing them. Returning refugees face obstacles including loss of documentation, loss of property and homes, issues related to conscription, as well as mines and unexploded ordnance. There is still a massive need for the provision of health, water, sanitation, food, education, and psycho-social support both within and outside of Syria for the Syrian refugees. Sources: Haaretz, Aljazeera; Reuters; United Nations children’s agency UNICEF; UN’s World Food Programme; UN refugee agency UNHCR; the Syrian Observatory for Human Rights, a British-based war monitor. On 14 April, 2018, the United States and some of its allies launched air strikes against Syria. Here is a report by Australia’s ABC about the latest on this development. For more detailed information on the situation in Syria, read this update from the global ACT Alliance. To donate to our Syria in Crisis Appeal, click on the ‘Please Donate’ button below (choose ‘Syria in Crisis Appeal’ from the drop-down menu).